Introduction Ageing is accompanied by increased risks of chronic disease, declined functioning and increased dependency. Physical activity is critical to retaining health and independence, but the majority of older people are insufficiently physically active to achieve these benefits and have high levels of sedentary (sitting) time. Activity programmes are often offered in retirement villages; however, their uptake is limited. Furthermore, although the physical environment in and around these villages can play an important role in decisions to be physically active, its role is often overlooked by research in these settings. We aim to develop, implement and evaluate a proof-of-concept motivationally embellished intervention designed to increase walking, reduce sitting and improve mental health in residents in retirement villages. Methods and analysis This will be a 16-week pilot intervention using a cluster randomised design with retirement villages as the unit of randomisation and residents as the unit of assessment. Fourteen retirement villages around Perth, Western Australia, will be recruited for the intervention. Objective audits of neighbourhood environments around each village will be completed using the Pathway Environmental Audit Tool. Seven villages will be randomised to the experimental arm and seven to the control arm. Only participants in the experimental arm will receive motivational training. All outcomes will be assessed at baseline, end of intervention and 6-month follow-up. Changes in physical activity levels, sitting time and mental health will be examined. Multilevel modelling will be used to analyse the data. A mixed methods process evaluation will also be conducted. Ethics and dissemination Ethics approval was granted by Curtin University’s Human Research Ethics Committee (HREC2016-0187). The results of the study will be disseminated via peer-reviewed publications, conference presentations and reports to, and seminars with, stakeholders. Trial registration The trial is registered with the Australian New Zealand Clinical Trials Registry: ACTRN12616001177448. An objective measurement of walking will be used. The moderating influence of objectively assessed neighbourhood environment characteristics as well as retirement village characteristics will be examined. Motivational mediators will be examined to elucidate mechanisms of change. Only a 6-month (not 12-month) follow-up will be possible due to resource constraints. Retirement villages are highly relevant settings to promote physical activity, as they aim to foster relative independence of residents by encouraging the preservation of functional capacity. It is expected that the number of retirement villages will continue to increase, given the rapidly growing ageing population. Given that retirement villages cater for a relatively broad group of older adults, they represent an important setting in which to examine the efficacy and effectiveness of health behaviour change interventions. Retirement villages differ substantially with regard to the socioeconomic status of their residents. For example, in some retirement villages accommodation is funded by residents themselves, but in other villages residents lease their accommodation or their housing is subsidised. Residents in subsidised tenancy tend to be the most disadvantaged in terms of socioeconomic status, mental health, substance abuse and general health. Indeed, it is well established that socioeconomically disadvantaged populations tend to suffer from more health problems and engage in lower levels of physical activity.11 12 Thus, it is critical to examine whether a health behaviour change intervention is equally effective in retirement villages with different socioeconomic groups of residents. In line with ecological models of behaviour change, interventions should consider the physical environment alongside individual and social factors.31 However, little is known about how the environmental characteristics of one’s place of residence impact on the effectiveness of behavioural interventions aimed at increasing walking and reducing sedentary behaviour.32 It is plausible to assume that the short and, especially, long-term effects of interventions focused on walking would be partly determined by neighbourhood ‘walkability’.33 This is especially the case for older adults who are likely to be highly influenced by the physical environment, since mobility and independence can be greatly limited by a poorly designed community space.34 Specifically, positive associations have been reported between perceived and/or objectively measured street connectivity, number of walking paths, traffic and crime safety, aesthetics, access to services, residential density and walking for different purposes in older people.34 35 A recent review of the literature found poor agreement between the perceived and objectively measured neighbourhood environments; each predicted unique variance in physical activity.36 Additionally, perceived environmental attributes have been shown to moderate the effectiveness of a motivational intervention focused on walking in middle-aged adults, whereby motivational aids were able to overcome the negative effects of low neighbourhood aesthetic appeal.32 Thus, in order to better understand the effectiveness of interventions, it is important to evaluate the moderating effects of both the objectively measured and perceived neighbourhood physical environments. A study with older adults from retirement communities showed that a 3-month intervention focused on addressing individual, social and built environment factors was successful in helping older adults change their perceptions of the environment so participants began to perceive fewer environmental barriers to walking and became more satisfied with their walking environment.37 Therefore, it is likely to be important to raise awareness of opportunities to walk in the local environment when implementing walking interventions with retirement village residents. Grounding interventions on sound theory is informative because theory helps facilitate an understanding of why and how intervention strategies work.38 One theoretical framework that has shown good potential to promote health behaviour change is SDT.39 Although many interventions have shown promise in increasing physical activity levels, a review of 57 interventions with older adults showed short-term but no long-term positive effects.40 SDT identifies enabling factors for long-term adherence to physical activity.41 The theory proposes that only autonomous motivation, that is motivation emanating from within the individual, is likely to contribute to sustained behaviour change, especially for behaviours that are important for health but that are not necessarily inherently enjoyable. In contrast, motivation resulting from feelings of guilt or pressure (ie, controlled motivation) is unlikely to result in sustained behaviour change.41 The social environment plays an important role in helping individuals internalise motivation for engaging in behaviours. Specifically, the provision of autonomy support (eg, by a walk leader), which is characterised by offering choice, meaningful information in a non-judgemental manner, being empathetic and minimising the use of pressure and control, can facilitate internalised motivation. These propositions have been extensively tested and supported in the healthcare (including physical activity) domain.41–46 For example, Thøgersen-Ntoumani and colleagues have shown that incorporating SDT-based motivational principles into the design of a 16-week walking intervention was effective in terms of promoting positive changes in physically inactive middle-aged and older University employees.46 Specifically, there were increases in walking, other types of physical activity and mental well-being by the end of the intervention, which were sustained at a 4-month follow-up. It was also shown that it was possible to train walk leaders in the provision of autonomy support to participants.46 This intervention format can readily be adapted for use with other population groups, after any necessary customisations. The overall aim of the study is to examine the feasibility and preliminary effects of a 16-week motivationally embellished peer-led walking intervention on walking, sitting and mental health in physically inactive residents in retirement villages in Western Australia. to examine motivational mediational mechanisms of behaviour change. This will be a 16-week pilot intervention using a cluster randomised design. Data collection will start in March 2017, and it is expected that all assessments will be completed a year later. Retirement villages will be the unit of randomisation, and residents will be the unit of assessment. Participants will be randomly assigned to either control or experimental arm with a 1:1 allocation, stratified by village. A researcher not associated with recruitment or data collection, and who will be blind to village identity, will carry out randomisation via computer software, after recruitment. Allocation concealment will be ensured, as randomisation will not be disclosed until the intervention starts. Fourteen retirement villages in Western Australia will be recruited. Seven villages will be randomised to the experimental arm and seven to the control arm. This number of villages has been selected because 30 villages would be considered the minimal sample size to estimate environmental moderating effects in a definitive randomised controlled trial (RCT).49 Targeting approximately half of the minimal sample size of villages will provide for a sufficiently robust estimate to inform power analyses for a future definitive trial. We aim to recruit villages (and match them as much as possible across both arms) that will be characterised by varying levels of social disadvantage (lease-for-life, resident funded or subsidised tenancy), physical environment characteristics (eg, perceived safety, safety from traffic and proximity to amenities) and levels of deprivation (as defined through Socio-Economic Indexes for Areas scores). We will recruit an average of 15 resident participants (total n=210) and five resident ambassadors (total n=70) from each village. However, given the pragmatic nature of the intervention and the fact that the sizes of villages differ greatly, the numbers of ambassadors and walkers are likely to vary per village. All participants, village coordinators and the data analyst will be blinded to allocation, given that in both arms participants and resident ambassadors will receive training without knowing that the content of the training will differ across villages. There will be no circumstances under which unblinding for those individuals will be necessary. Research assistants (RAs) who will collect data will be unblinded due to practical constraints. The protocol has been prepared in accordance with guidelines by the Standard Protocol Items: Recommendations for Interventional Trials and Template for Intervention Description and Replication.50 51 Completed checklists are provided as additional files. The role of the resident ambassadors will be to help promote the increase of walking and the reduction of sitting behaviours in the resident participants. The ambassadors will be trained to implement specific strategies to help resident participants achieve this. Each ambassador will be matched up with 3–5 residents whom they will work with for the duration of the intervention. The decision to have three to five residents per group was informed by preparatory work conducted by the research team.13 The ambassadors will provide a range of different types of support, including leading weekly small group walks, and encouraging participants to engage in self-organised walks. Their involvement will be phased out after week 10 of the intervention. To prepare the ambassadors for their role, initially all resident ambassadors will participate in a practical group-based 2-hour workshop, which will be led by members of the research team. In the control arm, the workshop will consist of information on the benefits of increased walking and reduced sitting, training in how to lead group walks in a safe manner, what to do in case of emergencies and the tasks needed to coordinate and lead the group walks. In the experimental arm, the resident ambassadors will receive similar information (some of it will be in handout format due to time constraints), but they will also receive training on the major types of motivation proposed by SDT, and they will be asked to reflect on their own motivation for their role. Resident ambassadors in both arms will receive printed material to support learning. In the experimental arm, resident ambassadors will also receive an additional 2-hour workshop later in the same day, delivered by members of the research team. In this workshop, the ambassadors will be introduced to the basic principles of the motivational framework underpinning the intervention (ie, SDT) and will engage in practical exercises that will aim to show how to support other residents’ autonomous motivation for walking and for reducing sitting behaviours. Specifically, the different motivations underpinning engagement in these behaviours will be described and illustrated. The resident ambassadors will then be introduced to ways in which autonomous motivation can be supported. For example, the resident ambassadors will be trained to encourage participants’ involvement and opinions in making choices (eg, walking routes and ways to break up sitting time), use open-ended questions, be empathetic, acknowledge difficulties or negative emotions, develop feelings of belongingness, provide competence-building feedback, avoid judgemental or controlling language, provide rationales for activities and encourage personal responsibility and initiative. The resident ambassadors will be encouraged to identify concrete examples of how they can put these principles into practice. They will also be provided with relevant examples. Two weeks into the intervention, a third 2-hour workshop will be offered to the ambassadors in the experimental arm to share successes and challenges in implementing the motivational strategies taught. Brainstorming will be encouraged, and solutions will be identified. In between the second and the third workshops, as well as after the third workshop, resident ambassadors in the experimental arm will use training material to achieve weekly goals (eg, helping participants feel successful) via the implementation of SDT-based motivational strategies. The resident ambassadors in the control group will not receive the motivational training, but the motivational training will be made available to them at the end of the project. Due to geographical distance between the villages in the same conditions, all workshops will be delivered in the ambassadors’ own retirement villages. In both arms, the residents will receive at the beginning of the intervention one group-taught 2-hour session, delivered by the research team, on the benefits of walking and reducing sitting time for health. In this session, they will also be provided with outdoor walk route maps and information on step counts for specific walks to destinations inside and outside their villages. The participants in the experimental arm will receive the same information but in a more condensed form during the workshop (but with more detailed handouts to read afterwards). They will also be offered training on motivation using SDT principles. Given that SDT argues that facilitating the understanding of the importance of the activity will help individuals to self-endorse it, the participants in the experimental arm will undertake exercises in which they will reflect on how and in what ways the programme will be beneficial to them and how it aligns with their personal values. Furthermore, the participants will receive training in behaviour change techniques (eg, implementation intentions, self-monitoring and goal setting) in an effort to optimise and support motivation. For example, participants will be asked to reflect on personal barriers to walking and reducing sitting time and how to overcome them by planning a response for anticipated obstacles (ie, ‘implementation intentions’). They will be given self-monitoring exercises (in addition to logging step counts) so that they can become more aware of how their walking and sitting behaviour patterns change and how to cope with tempting situations (eg, sedentary alternatives) that might prevent them from undertaking their walks or breaking up their sitting time. Goal setting principles will be illustrated, and relapse prevention will be discussed with suggestions of how to get back on track following temporary setbacks. Furthermore, they will also be taught behaviour change techniques regarding ways of breaking up long periods of sitting. A tips sheet outlining specific strategies will be produced based on the results of a review by Gardner and colleagues and preliminary qualitative work which is currently being conducted by our team with 20 residents.28 As for the resident ambassadors, the workshops will be delivered in the residents’ own retirement villages. The participants in the experimental arm will be given motivational booklets that will include week-by-week guidance on implementing the behaviour change techniques covered in the workshop. They will also be supported in successfully using these techniques by the researchers by biweekly visits (either visiting participants individually or in groups) or phone calls (which will also aim to facilitate participant retention to the study and to collect information on any adverse events). These visits and phone calls will be weaned off gradually during the 16-week intervention to prevent participants becoming reliant on this support. Participants in the control group will not be given motivational booklets but will receive a general fact sheet with practical examples of increasing physical activity and reducing sedentary behaviour. The full intervention package will be offered to the villages in the control arm at the end of the project. The intervention material will be made available to participants in the current trial in hard copy and online on completion of the testing of the intervention (eg, via the project website: www.riat.com.au). 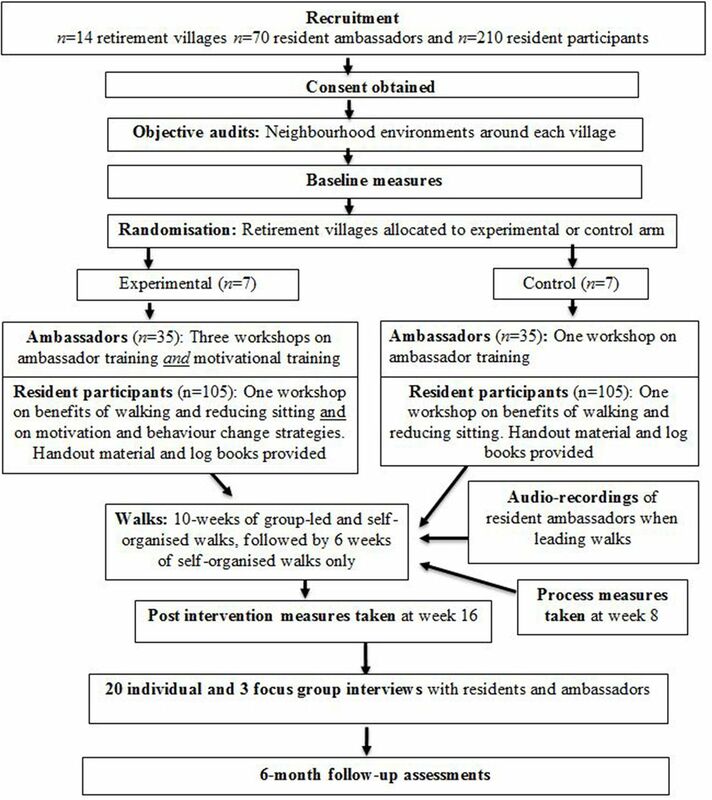 Group-led walks constitute an important component of the intervention. Twenty-to-thirty minute group-led walks, which will be led by resident ambassadors, will be offered during the mornings and afternoons for the first 10 weeks to participants in both arms. Participants of similar walking capability will be put in the same group based on results of a 6 min walk test. Participants will be encouraged to partake in three group walks per week. Duration and intensity of the walks will be adapted to the needs of the groups. The routes will be risk assessed by the researchers prior to the intervention commencing. Criteria for assessment will include assessing the level of pavements, street lighting, congested traffic areas, traffic lights, marked foot crossings for pedestrians or pedestrian island included in the midpoint of the road. The routes will be planned around the retirement villages to enable those participants who feel unable to walk for the full duration of the walk to walk only part of the route. In addition to the group-led walks, the residents in both conditions will also be encouraged during the first 10 weeks to engage in at least two self-organised walks per week (indoor walk routes will also be planned and promoted). In the final 6 weeks, the participants in both arms will be encouraged to self-organise all their walks in smaller groups or individually. An outline of the procedures for the trial is presented in figure 1. Descriptive data on uptake will be recorded by the research team during the recruitment process. The numbers of participants consenting to participate will be compared with those approached. Attendance at the group walks will be monitored by the resident ambassadors via a group walk register. Participant residents will be asked to document engagement in self-organised walks that are at least 10 min long in their logbooks. These data will be used to assess level of adherence. Attrition will be assessed by examining dropout rates that will be recorded by the research team (including dates); reasons for dropout will be logged where possible. Furthermore, acceptability of the intervention will be assessed via a nine-item scale adapted from our previous work . Example items include ‘I enjoyed the programme’ and ‘I would recommend this programme to other people’. Response options range from 1 (strongly disagree) to 7 (strongly agree). The primary outcome will be step counts collected via participants’ log books and will be assessed at baseline, at the end of the intervention and at a 6-month follow-up. For self-monitoring purposes, New Lifestyles NL-1000 pedometers, which have been shown to accurately measure steps at varying speeds, will be provided to participants in both arms 2 weeks prior to the start of the intervention.56 Data collected in the first week will not be analysed to account for possible reactivity effects.57 The step counts from the second week will be used as an estimate of baseline walking. The Hospital Anxiety and Depression Scale (HADS) will be used to measure anxiety and depressive symptoms.64 The scale comprises 14 items: seven items to measure anxiety (eg, ‘I can sit at ease and feel relaxed’) and seven items to assess depression (eg, ‘I still enjoy the things I used to enjoy’). The items are scored on a four-point scale ranging from 0 to 3. The psychometric properties of the HADS have been widely supported in previous research.65 Perceptions of loneliness will be measured using three items psychometrically validated by Hughes and colleagues.66 An example item is ‘how often do you feel you lack companionship’ with responses including ‘hardly ever’, ‘some of the time’ and ‘often’. Feelings of energy will be assessed using the Subjective Vitality scale, which comprises six items.67 One example of the six items is ‘I feel alive and vital’, with responses ranging from 1 (‘not at all true’) to 7 (‘very true’). Support for the scale’s psychometric properties has been reported by Bostic et al. 67 See table 1 for an overview of all outcome measures. To examine the degree to which the resident ambassadors use the taught strategies as planned, we will audio-record three randomly selected group-led walks for each of the resident ambassadors (the ambassadors will be asked to audio-record every walk they do). A rating sheet will be constructed for the purposes of this study and will be used by two blinded RAs to code the verbal provision of SDT-based motivational strategies. Each transcript will be coded independently by the two coders, and levels of inter-rater agreement will be calculated. Additionally, in line with methods reported by Matei et al, logbooks and tick sheets will be collected from participants after the intervention to assess the extent to which behaviour change techniques and tips, provided as part of the workshops and the booklets, were used by the participants.30 Information on barriers and facilitators of intervention implementation will be collected via 20 individual and 3 focus group interviews (each with 4–6 individuals) after the trial, with residents (high and low adherers) and resident ambassadors in both arms. Reasons for dropout will also be explored for participants who withdraw from the study at any time point, either via a short questionnaire or a brief exit interview. Characteristics of the neighbourhood environment will be assessed at baseline only using validated self-report and environmental audit measures (Path Environment Audit Tool).68 69 The self-report measure will assess perceived pedestrian safety, safety from crime and traffic and neighbourhood aesthetics. The PEAT is an audit tool assessing four domains: design features, amenities, maintenance and pedestrian safety from traffic.69 Walking routes within 1 km from the selected retirement villages will be identified. Two RAs, who will be blinded to the randomisation, will be trained by the research team in using the PEAT manual. Both auditors (RAs) will assess each identified route. Any discrepancies in ratings will be resolved via discussion between the two raters. Scores on each domain of the PEAT will be computed for each walking route. Sites will be classified as being high-walkability or low-walkability on a specific PEAT domain based on median splits. Information on type of tenancy (resident funded, lease-for-life or subsidised) will be provided by the retirement villages. All hardcopy data will be stored securely in locked filing cabinets at the host university. These hardcopies will include participant ID only. The document linking participant IDs with any identifying information will be kept securely on a password-protected computer and stored on the university’s secure server. Consistent with data management policy, all data will be kept securely for 7 years, after which it will be destroyed. Only the research team will have access to the data. The main purpose of the analyses is to develop reliable power estimates for a subsequent definitive trial. Specifically, descriptive statistics on variable means and adherence to, and drop-out from, the intervention will be calculated. Furthermore, internal reliability coefficients for questionnaire data will be estimated. The main analyses will be conducted using multilevel modelling (also called mixed-effects modelling) on a per-protocol and on an intention-to-treat basis, adjusting for baseline scores. Multiple imputation will not be used to replace missing values, as multilevel modelling can handle well cases with missing values.49 This type of analysis is superior to standard regression analyses and repeated measures analyses of variance as it adjusts standard errors to take into account village clustering effects.49 We will compare mean scores and rates of change across arms for walking and sitting behaviours and all other outcomes; we will also examine individual variation from mean trends. Perceived environmental and types of tenancy (lease for life, resident funded and subsidised tenancy) will be analysed as moderators of the effects of arm allocation on the outcomes. Mediation analysis will be conducted via path analysis, adjusting for cluster effects. CIs of outcome variability and effect sizes will be calculated. An upper 90% confidence limit of the intraclass correlation coefficient of the primary outcome will be estimated to inform the sample size calculation for a future definitive clustered RCT. Data will be transcribed verbatim and coded using QSR NVivo. Thematic analysis using a framework approach will be used to analyse the data from the individual and focus group interviews.73 Two independent coders will be used in the analysis process, and peer-review procedures, using other members of the research team, will be employed to challenge interpretations of the data. Any disagreements will be followed by a discussion until consensus is reached. Furthermore, member checking will be adopted to enhance trustworthiness. The study is not formally powered to detect differences in outcomes, but is designed to generate primary outcome data to power a definitive trial.74 The size of the pilot will enable estimation of various useful information (recruitment rates, retention rates, questionnaire response rates, effect size and variability) to be calculated with reasonable precision. Ethics approval for the trial has been granted by Curtin University’s Human Research Ethics Committee (HREC2016-0187). All ambassadors and resident participants will be screened for eligibility by the research associate when expressing an interest to take part in the project. Following these checks, they will provide written informed consent. It will be made clear to participants that they will be free to withdraw from the programme at any point without giving a reason. Any significant modifications to the protocol of this study will be subjected to university ethics approval and will be subsequently documented in the Australian and New Zealand Clinical Trials Registry. All ambassadors and resident participants who take part in the trial will receive a written summary of the results at the end of the project. The findings from the study will also be reported to various stakeholder groups via written reports and seminars. These stakeholder groups will include, but may not be limited to, retirement village providers, resident associations, ageing organisations, aged care providers, policy makers and urban planners. The findings will also be disseminated widely via the media offices of the participating universities, partner organisations, via social media channels including Twitter (@ResinAction2016) and the project website (www.riat.com.au) and to other academics and policymakers via peer-reviewed journal articles and conference presentations. RiAT is a motivationally embellished pilot cluster RCT, which aims to help physically inactive residents of retirement villages to increase levels of walking, reduce sitting,and improve mental health. The intervention will use strategies to specifically target older adults in retirement villages who do not currently achieve the guidelines to improve or maintain health and well-being. These groups are in greater need with regard to improving health and well-being and have greater scope for improvement than their more active counterparts. Any potentially positive impacts of the intervention on individuals’ health, well-being, independence and functioning could reduce the risk of these residents going into residential care settings (such as nursing homes) or delay such moves. This in turn could have substantial public health implications in terms of improved quality of life and reduced healthcare expenses. As part of the current pilot trial, we will record trial expenses relating to workshop delivery and production of training material that could inform a health economic analysis in a future definitive trial. In contrast to previous trials, the present intervention uses a peer-led approach whereby resident ambassadors are motivationally trained to support their less physically active peer residents. Indeed, studies employing the theoretical framework underpinning the intervention (ie, SDT) have shown consistently that the provision of need supportive strategies from key agents within the social environment helps individuals facilitate improvements in quality of motivation and leads to sustained behavioural engagement and positive health and well-being outcomes.46 75 An important contribution of the study to the extant SDT literature is examining whether the physical environment and types of tenancy moderate intervention effectiveness. Beyond intervening at the level of the social environment (ie, training ambassadors), the trial also incorporates training to equip residents with skills to self-sustain both physical activity and sedentary behaviour changes over the longer term, using evidence-based behaviour change techniques. This is critical because previous research has shown that when older adults begin activity programmes, participation is often short lived.76 A thorough process evaluation will enable the identification of techniques that are more versus less effective, which will inform future intervention efforts in this, and similar, settings. The results of the present pilot RCT will inform the testing of a definitive trial. If that trial is successful, the intervention programme can be packaged and rolled out for use by providers of physical activity programmes for older adults across Australia and other countries if appropriate. Furthermore, the intervention, or adapted versions of it, can be used across different types of accommodation, or complement existing physical activity programmes for older adults. To facilitate its adoption, the intervention material will become freely available in both printed and online formats following the definitive trial. World Health Organisation(WHO). Global aging and health. 2016 http://www.who.int/ageing/publications/global_health.pdf (cited 2016 May 28.).
. PsPAFPA S , ed. The Baby Boomers and Beyond Report: physical activity levels of older western Australians [Internet]. 2006:5–15. http://eprints.qut.edu.au/67175/1/Saarloos_2008_-_The_baby_boomers_and_beyond_report.pdf. World Health Organisation. Global recommendations on physical activity for health. WHO 2010.
. Ecological models of health behaviour. Health behaviour and health education: theory, research, and practice. 3rd edn. San Francisco: CA: Jossey-Bass, 2002:462–484.
. A systematic review of agreement between perceived and objective neighbourhood environment measures and associations with physical activity outcomes. Env Behav (Published Online First: 29 Sept 2016).
. Mediating variable framework in physical activity interventions. how are we doing? how might we do better? Am J Prev Med 1998;15:266–97. Hox J multilevel analysis: techniques and applications. Mahwah, New Jersey: Lawrence Erlbaum Associates Publishers, 2002. Australian Government Choose Health: be active [Internet]. Department of Health and Aging (DoHa). 2005. https://www.health.gov.au/internet/main/publishing.nsf/Content/3244D38BBBEBD284CA257BF0001FA1A7/$File/choosehealth-brochure.pdf. (citied 2016 Nov 15).
. The physical activity scale for the elderly (PASE): evidence for validity. J Clin Epidemiol 1999;52:643–51.
. Cross-validation of item selection and scoring for the SF-12 health survey in nine countries: results from the IQOLA Project. J Clin Epidemiol 1998;51:1171–8.
. A short scale for measuring loneliness in large surveys. Res Aging 2004;26:655–72.
. Development and reliability and validity testing of an audit tool for trail/path characteristics: the Path Environment Audit Tool (PEAT). J Phys Act Health 2006;5:746–60.
. Thematic analysis. Qual Res Clin Health Psychol 2014;24:95–114. Contributors CT-N, EB, KDH, EC, SJHB and NN conceived the project and obtained the project funding. EQ and NN assisted in the development of the intervention materials. CT-N is coordinating the project. AW is managing the project on a day-to-day basis and is leading the data collection and will supervise causal research assistants. CT-N and AW drafted the manuscript, and all authors read, edited and approved the final version of the manuscript. Funding This work is supported by the Western Australian Health Promotion Foundation (Healthway), grant number: 24258. EC is supported by an Australian Research Council Future Fellowship (FT3 #140100085). Competing interests SJHB: funding has been received since 2013 for consultancy work from Fitness First, Nuffield Health and Unilever. None of these are currently active. Funding was received in 2016 for consultancy work for Halpern PR Limited. In-kind support through the provision of a sit-to-stand desk was provided by Ergotron from 2012 to 2014. Advice has been requested by and offered to Active Working, Get Britain Standing and Bluearth, none with funding. Ethics approval Curtin University’s Human Research Ethics Committee.